LOVE THE SIGHT AND SCENT OF PETUNIAS? Then do what I do each August, and propagate your plants. 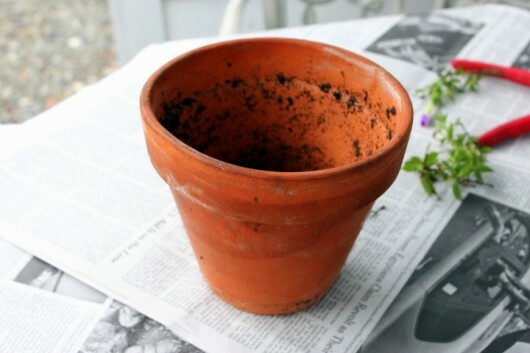 Three stem cuttings in a 6-inch pot will quickly form roots at this time. Brought indoors before frost, and placed under lights or in a sunny window, the young plants will bloom and bloom from December on. Kevin, can’t I simply bring my big container-grown petunia indoors for winter? Yes, you can. Just prepare yourself for a cannonade of leaf-drop. And a Victorian death scene. For a petunia which has matured outdoors is bound to fail when it is introduced to the less-than-ideal conditions of the average home. On the contrary, fresh, young plants — those acquired from the cuttings I mentioned earlier — are itching to grow! They have youth on their side, and can easily adapt to less-than-perfect conditions inside four walls and a roof. 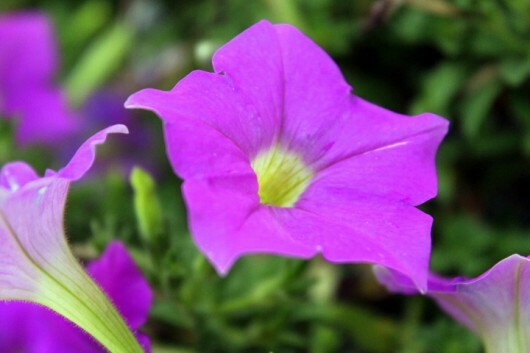 Before you take cuttings of your petunia, make sure the plant has been well-fed and watered. I feed the pinkish-lavender petunia that sits on my Satyr’s head (he isn’t amused) with every watering. Cut stems approximately 3 inches in length. Then remove all leaves from the lower half of the stem. Remove all flowers, buds, and seed-pods, too. 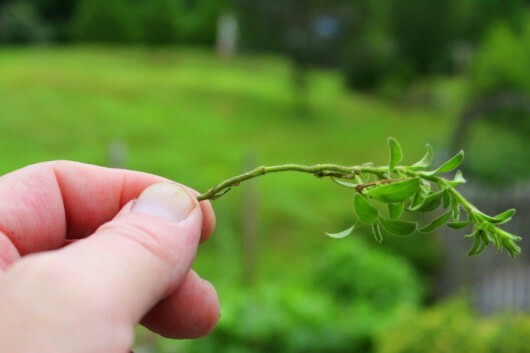 Otherwise, the cutting will focus its energy on flowering and seed-ripening — not growing roots. Now grab a perfectly clean, 6-inch-diameter clay pot. Okay, my clay pot isn’t the least bit clean. But I’m not worried that disease will be transferred to my cuttings. The pot’s previous occupant was the very picture of health. 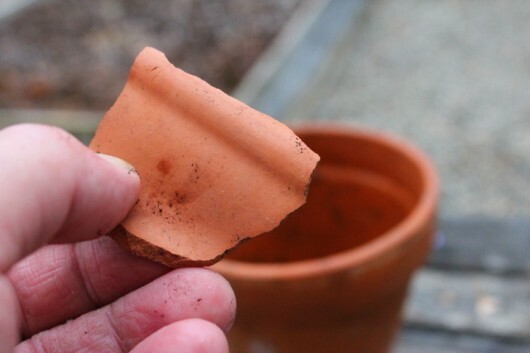 Take a piece of broken pottery, and place it over the pot’s drainage hole. This maneuver, known as “crocking a pot,” will keep soil from washing out when the plant is watered. Bobble-head that I am, I forgot to take a picture of this next step: Fill the pot with damp, soil-less potting mix. A commercial peat-moss and perlite blend will work well. 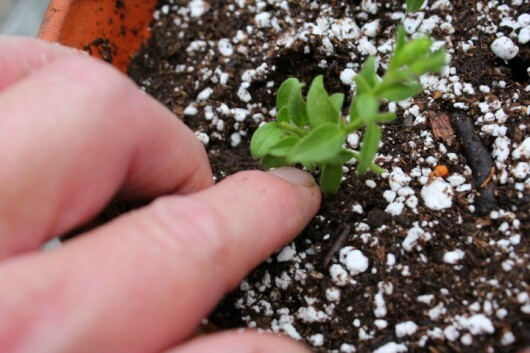 As always, be sure to allow a 1-inch opening between the surface of the soil and the rim of the pot to allow for water. 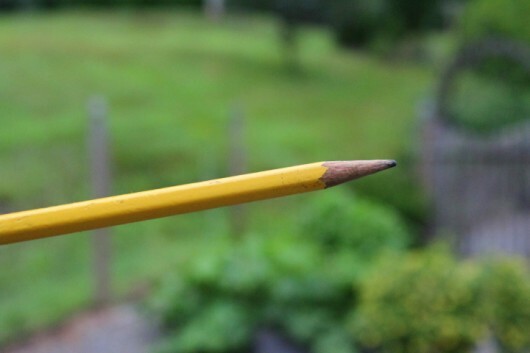 And plunge it into the soil, to a depth that approximates the length of your cutting. You’ll need to make 3 such insertions to accommodate the 3 stems. I arranged mine at equal distance, and in a “V” formation. Take a cutting, and lower it into a hole, right up to its lower leaves. Then press firmly around the stem, so that soil and cutting make good contact. Proceed as above with the remaining 2 stems. Now gently water the cuttings, until excess drips through the drainage hole. Keep the stems moist, but not saturated, throughout the rooting process. Now step back and admire your professional potting-job. I say “professional,” because your arrangement includes a 1-inch reservoir for water. 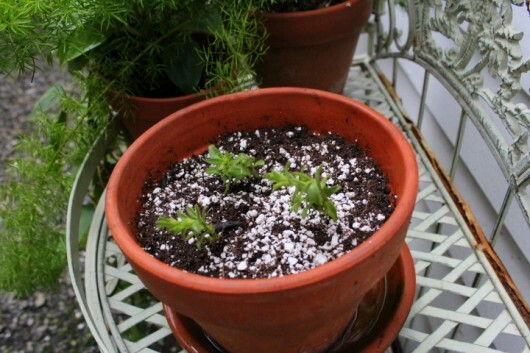 Amateurs usually pile the soil too high, which results in water spilling over the side of the pot. While they are busy making roots, the cuttings will need to reside in a bright but sunless location outdoors. I set mine on the semi-shaded stand that holds my vacationing philodendron, ferns, and other shade-loving houseplants. Alternatively, you could root the cuttings indoors. Give them a bright window or a position under fluorescent lights. Be sure to provide plentiful fresh, humid air by opening all of the windows in your home. Roots will form in about 6 weeks. You won’t need to tug at the plants (as some gardeners recommend), in order to discover that roots have developed. Just look for signs of new growth. In mid- to late-September, and well-before the first frost, bring the rooted youngsters indoors to a sunny south or east window, or even better — under fluorescent lights. As mentioned before, open all windows to provide a fresh, humid atmosphere. Water whenever the top inch of soil feels dry (stick your finger into the soil). And then water thoroughly, until excess drips out the drainage hole. My own young petunias reside either beneath the fluorescents that light my kitchen counter (as above), or on the fluorescent-lit shelves in my Writing Room. Plants under lights require more food and water than their window-grown colleagues. These I feed with every watering, at the rate of one 1/2 teaspoon per gallon of room-temperature water. I reduce the food to one 1/4 teaspoon for window subjects. I’ve had great results with Jack’s Classic Blossom Booster (10-30-20) — the same formula that encourages my African violets to bloom and bloom. When they are grown in a sunny window or a light garden, the plants will form buds in early December. These will open as sweetly-scented, pink, purple or white trumpets by month’s end. And with regularly deadheading, the flower-show will continue until late May, when the plants go on holiday outdoors. 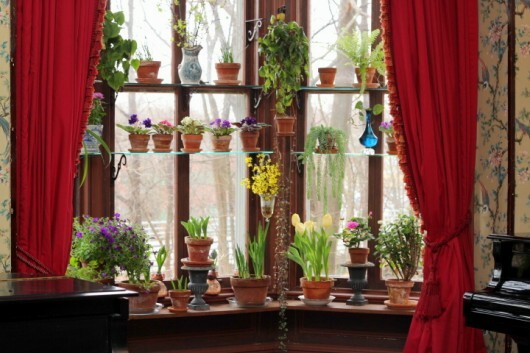 In the winter window garden, purple petunias associate well with flowering bulbs and African violets (pictured above is my Music Room window; the petunia is located on the left-hand side of the broad windowsill). Here is the same plant, at close-range. Meanwhile, a white petunia (shown here in my upstairs bath) positively dazzles in a setting of rabbit’s-foot ferns (you can propagate this plant, too) and pink azaleas. Well. I hope this petunia-as-wintertime-houseplant tutorial was useful to you in some small measure. Perhaps you’ll let me know by leaving a comment. As always, an angel rings a bell whenever someone posts on this site. I love this idea! 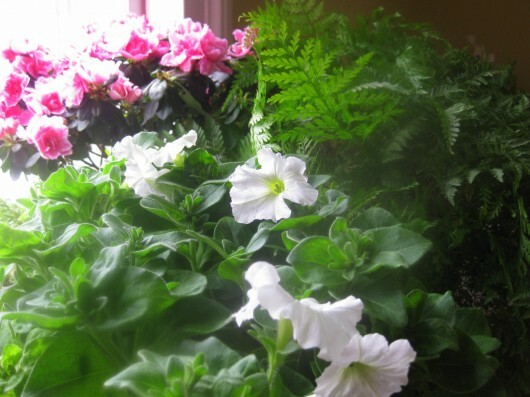 Petunias are one of my favorite flowers, but I never thought to grow them indoors overwinter. I’m going to try this. I love the music room window. What a positively pleasant site to look at in the dead of winter! I might have to incorporated that in my basement redo. I have floor to ceiling windows down there just begging for some shelving like that! This makes me want to prowl the neighborhood under cover of darkness clipping bits of petunias wherever I find them. I didn’t plant any–I suppose I COULD go the legal route and purchase some from the nursery down the road! I’ve always assumed the deer would eat them so haven’t planted any-I suppose I could google and find out! Thank you! Beginner here, stunned my window box petunias are still alive ( since May!) …I am DEFINITELY going to try this. PS I laughed out loud about putting the soil to the top because I did that exact thing when I repotted my spider plant this year…. I love that color! Pinky-Lavender! That color mixed with the dark purple and white petunia’s, it looks awesome!!! I am SO going to try this! How fun! You have got to be kidding! You are so frugal and I love that.. This is almost up there with making your own boxwood hedges! Thanks again, Kevin! I’m going to root cuttings of all my expensive Wave Petunias and save myself a bunch of money next summer! Yep. I’m going to try this!! Thank you! 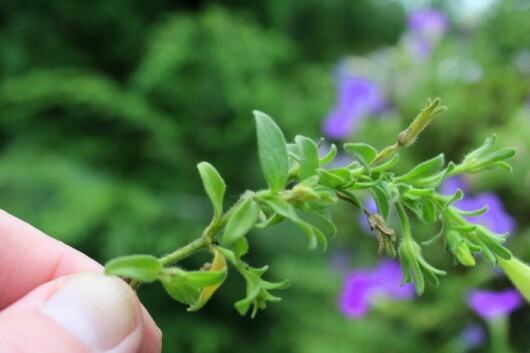 Hi Ruth – You can propagate calibrachoa via stem cuttings, too. Although calibrachoas in the “Million Bells” series are patented, it’s apparently okay to reproduce them for personal use. I am going to do this today w/ Hula Hoop Blue and a variety from a mix of double petunias. I put my petunias in late this year and when I got to the garden center the selection had been pretty much wiped out, but I’ve been happy w/ these varieties. Since I was buying the little six-packs so late , I also had to choose between mildly pathetic and extremely pathetic. As sad-looking as they were, following your advice on daily watering and feeding has given me healthy, abundant plants. I’ll be thrilled to see them inside in winter. Let’s hear it..3 cheers for Kevin..he just saved us a bunch at the gardening store again!! thank you sooo much!! Love your frugal ways that are sooo lovely! Just finished potting up three pots of petunia slips for the house this winter. Thank you again for the tip! 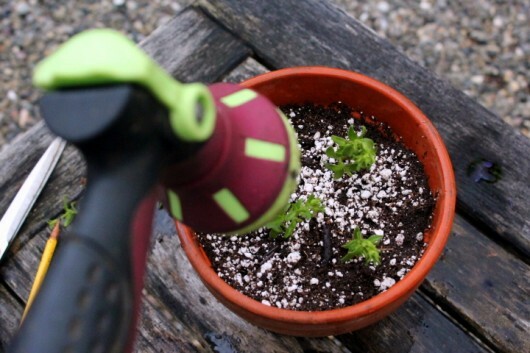 Have you tried this in reverse, so to speak–took cuttings from the indoor plants for summer? I usually start petunias from seed, but they are so tiny and fragile, and take SO long, that if I get behind, I am waiting quite a while for blooms in summer! Hi Mary – Yes, I’ve taken cuttings from my “winter petunias” and rooted them for summer hanging baskets. Much, much faster than growing new plants from seed. I will definitely give that a try this year with my petunias ~ I haven’t tried rooting before. For the past two years I have saved all my flower box geraniums by cutting them down to a couple inches and potting them. They Winter in my loft under grow lights and save me lots of money in the Spring ~ I used to grow them from seed and much prefer this method. Thanks for another great idea. I am so exited to try this! What a wonderful idea to keep these gorgeous blooms around! Every winter I bring one to two of my roses indoors and stuff as many plants as I can around the base ( I use really large pots). Last year I had my Yellow Knock out Roses, with Lantana, coral bells and a really cool fern (have no idea what kind) oh and a pink carnation too. it’s fun to try new ones in the winter and I really only have one long floor length window to work with, so it gets pretty crowded. I am going to add petunias this year. My geraniums have gotten very long and scraggly. Can I do the same thing with them as you do with petunias? Wow! I hope to try this! I’ve had good luck with storing our geraniums, in their pots and all, in our dirt- floored cellar; in Spring, I place them outside and they usually start growing and blooming just fine. We don’t really have a good indoor place for wintering over plants, but it’s definitely worth trying! Thanks! Your directions with photos are the best! I love the way you save me money! Thanks Kevin!!! This really gives me ‘inscentive’ to clean up my computer room which has a southern facing window…I will make it ready for a wonderful winter of petunias and some of the other flowers mentioned above….thank you, Kevin….I will love this room more now! Thanks, cool thing worth learning about and then doing. I have some lovely Black Velvet petunias that I may try this with. If only my cats wouldn’t eat any plant I brought into the house! Retta, this absolutely works with Geraniums! I’ve got tons of them from this very method! I did NOT know it would work with petunias, thanks again Kevin for all you do and share with us! Thanks to you and your fabulous how-to tutorials, I have had success for the first time EVER in generating new plants from an African violet leaf. With this success, I have tried putting a leaf from a spectacular double purple gloxinia plant under the same conditions and I honestly believe tht a tiny root-bulb is developing. Unfortunately I did not buy petunia plants this year because some critter always devoured them for their lunch. Maybe it’s not too late to visit a nursery to get a basket with petunias. Thanks to you, if so, I just know I’ll have more flowers this winter. This saves a ton of money each spring and the early garden gets going faster, especially mixed container plantings. Kevin, once again your timing is impeccable. I have some favorite petunias that I want to share with a friend and also grow for next year. I have begun collecting seeds (what a sticky project), however, your directions for cuttings will be much easier for both of us. 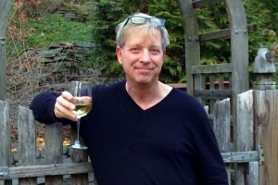 I mention your timing……….I was harvesting lavender at the same time you posted your lavender cookie recipe and I was searching for a new breakfast recipe when you posted your gratin of hard boiled eggs. And your winter sowing directions were a huge success, although I got a little carried away with my seed collecting and was passing out cleome seedlings to anyone and everyone. 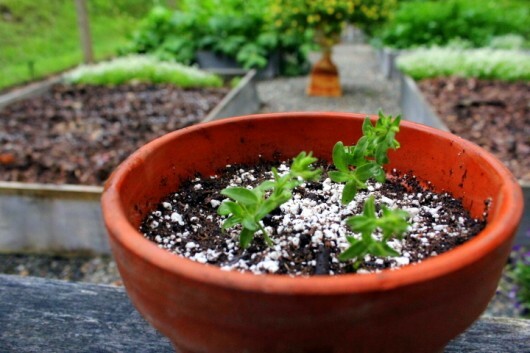 I have been doing this with geraniums for a few years now and it works great. This spring I even just placed some geranium cuttings in the ground when I pruned the ones I had grown over the winter (to give them a bushier shape) and they are doing beautifully. I have also done it successfully with coleus for a couple of years. Can’t wait to try it with petunias. I left a comment on your giveaway post w/o noticing that it is your 15th anniversary. I hope it was a very joyous celebration. Happy belated anniversary!! Now for a very amateur question, what constitutes a semi-shaded spot? A few hours of sun? A spot where the sun gets filtered a bit? Looking forward to trying this. I wondered if you had any tips for taking cuttings (successfully) of geraniums? I haven’t had much luck with trying this. Thanks for the tutorials~terrific info. Hi badger – Thank you. Just returned from Cambridge/Boston. Regarding the petunia cuttings, the goal is to let them make roots in bright light, but without any direct sun. Direct sun can injure the stems. Filtered sun is fine. I’ll try to clarify this in the instructions above. Hi Julia – I propagate geraniums (the annual, big-flowered zonal-type) in the exact manner as petunias. Remove all lower leaves and also the stipules (little flaps where leaf meets stem) from the lower half of the cutting. 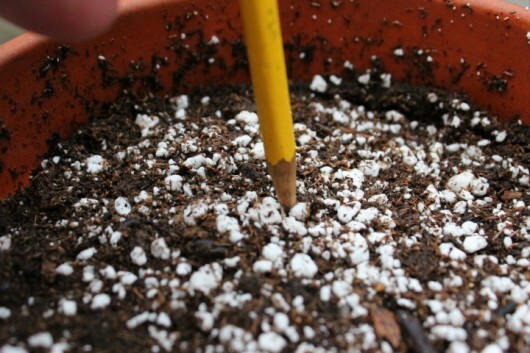 Use one stem per 4-inch pot. Keep out of direct sun until roots have formed — about 4 weeks. This is a great idea! 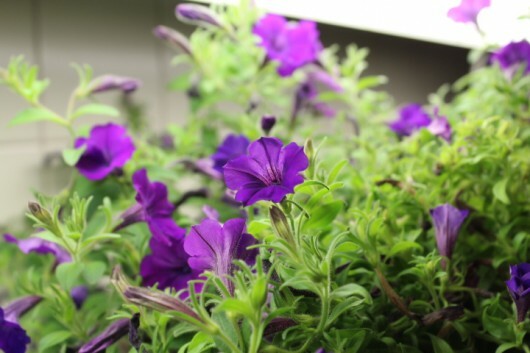 I love petunias–their yummy colors, their fragrance and the sweet cup-like blossoms. I will definitely be taking cuttings. What a pick-me-up to have these in the window while it is snowing and blowing outside. Could I also do this with impatiens or wax begonias? Thanks, Kevin. Hi Naomi – Speaking from experience, wax begonias and impatiens make terrific wintertime houseplants. Propagate them in the same manner as petunias. to fill in the garden for next year. I’m trying cuttings from roses and African impatiens too. Petunias in Winter, will be a welcome sight up here in Canada, especially the mid west Winnipeg. Can hardly wait to get started to clip my plants. Great suggestion as usual Kevin. Hi Carolyn Del – I can suggest two others from the outdoor garden: Wax begonias and impatiens. Both make terrific, ever-blooming wintertime houseplants. Propagate them in the same manner as petunias. Common zonal geraniums are easy to propagate from cuttings, too, but when started in late summer they rarely bloom before March or April. Jackie Bain – Clip away! I never thought of Petunia cuttings for the house. I have had the same Geranium plants for years. When they get too long I cut them back and add the cuttings to the same pot – keeps them full. I have a question about the Petunias. You put three cuttings per pot – would four or five cuttings make a fuller display or would that be too much for the pot size ? Hi Laurel – Speaking from experience, 3 cuttings per 6-inch pot is the absolute max. Believe me — as they grow, the cuttings will fill the pot. And then some! Now that I am retired I am spending much time gardening. I have geraniums, petunias & calibrachoa and am excited about trying this with all 3! Thanks for sharing this great idea! I had discovered by accident that petunias make awesome cut flower arrangements that are long-lasting. I didn’t think of making them cuttings, though. Hi Margaret – Ooh…cascading petunia stems in a cut flower arrangement…gorgeous! I’ve never root cut anything, but this has inspired me to try. It gets very expensive to buy new flowering plants every year. You people that share these tutorials show the love and concern of good Americans for all of us. I kind of discovered this process by accident.Well sorta. it started in the spring one year when I bought a petunia too early. It got nearly killed. I took cuttings just to see if it could be done and placed them in my seed starting trays. They didn’t die. Same with some miniature rose cuttings. I took those outside. There were other years I took petunias inside to weather an early frost threat. I noticed they didn’t pine away as badly as other outdoor plants, but I still didn’t think to keep them. This year I kept a petunia indoors all summer long by accident. (Pretty Much Picasso) I was propagating it to get more of it, save money and add to my outdoor garden. But I forgot to take the rooted cutting outside. So it survived, even bloomed under fluorescent lighting. It even got pretty huge. I still have it. Pruned it back, repotted, and seeing how long I can keep it over the winter. The last of my petunia cuttings that seemed to be doing well all decided to die this week. I did not get them done in August but I took heart that you had had success with some that were taken later. My thumbs are not very green. Oh well, I will try again next year. Thank you for the idea on propagating petunias. I have a purple sweet potato plant that I have trimmed back. I put the cuttings into a pot with the green block one uses for cut flowers. Added water and let it go. It is showing signs of life and looking healthy. I also put a geranium stem that broke off. It too is doing well. So, in May, can you plant them in the ground right away? Or, do you have to harden them off in some way? Hi Ronnee — Cut the plant back in April, and harden if off in May before planting out of doors. Alternatively, you can take more cuttings from wintered plant, and create fresh, new subjects for outdoor enjoyment. This is the post that keeps on giving! I live in Spokane, Washington, and the beautiful petunias we enjoy all summer long surely would make the long winters more bearable. Thank you for the explicit instructions with pictures. I hope to replicate your success. Hi Kevin. Was looking for suggestions on the best way to root petunia cuttings and found your website. Love it! I’m in the process of moving, so summer was spent digging up plants to move and not planting much out in the garden. However, in the spot my peonies used to be, a purple petunia popped up and bloomed most of the summer. In fact, even after freezing weather, it is still blooming. Decided to take some cuttings today, and I found 6 or so young shoots growing from several of the older stems, perfect for cuttings! Was trying to decide, if I should use rooting hormones on the cuttings. Noticed that you didn’t use them, so maybe I’ll try with and without hormones to see if it makes a difference. Love your music room window. My new house has a large bay window in the living room that faces north and a large picture window that faces east. Have visions of foliage and flowering plants in front of both windows, and your window has given me some ideas. Thanks! Fantastic idea!! I love my petunias all summer, and hate that I have none all winter!! Now I will! Meanwhile, I purchased a large Duranta which I quite enjoy also. Any ideas about why it is so unhappy indoors? Leaves curling and dropping, altho I keep it well watered and ferilized it. It is in a sunny window. thanks!! I am a teacher in Spokane and am looking for blooming petunias for a class this January. I didn’t see this post until just now and I didn’t carry mine over as well as if I had followed these instructions. Any chance that you would be willing to share a few flowers? Hopefully my name becomes a link that you can use to email me back. Otherwise, I will check this post. Thanks! Darn, it is spring and I can’t wait till fall to try this! … Thank you. I just bought a black cat petunia for my old cat, Poe, named after the story of the black cat. He left us last night, and i wanted a flower I can keep in his memory. I’m hoping for many years of blooming (away from kitties), to remember my irascible knitting pal. Your propagation plans are very clear and concise, even to a novice like me. Thanks very much for this! Thank you, flowers have become my new passion. I am a late bloomer. Great instructions, thanks! I followed your advice for separating my ferns and it worked. Thank you very much for the good advice, keep it up! What a wonderful idea to brighten with color and smell a dreary Winter! Can’t wait. Wonderful idea Kevin will try in Feb. so hold thumbs. I have bad luck with petunias in summer but am willing to give it a shot. Come and visit the beautiful gardens in Cape Town you’ll be blown away. Thanks for the great tips on Petunias, Kevin. I have a tip to share, that I heard about Geraniums. I heard that you can bring a Geranium indoors for the winter and place it in a dark room, preferably in a basement. Keep it there all winter and bring it outdoors in the spring and it is supposed to start growing and blooming again. I have not tried this yet, but I plan on trying it this fall, with the Geranium that I received from my sweet daughters for Mother’s Day. Thanks for running this great tip again! When I was a teacher, I took begonias and geraniums into my classroom for the winter. Never thought to take petunias in because they’re always sold as “annuals”, which they aren’t!! I think I’ll take cuttings of some of my new, cool, fancy colored petunias this time around. When they start blooming mid-winter, I’ll take them into the assisted living center near me. I’ll bet a lot of the people there have not seen some of the newer colors on petunias. If I can get some of my wild sun coleus to root, I’ll put them in the same pot. One question…how soon do you start feeding the cuttings, and how often do they need to be fed? Many thanks for all you do….. This is the first year I’ve planted a bunch of petunias, and they smell amazing. Is a south facing kitchen window too much for them? Thanks for sharing all your talents with us. I look forward to your newsletters. P.S. My cold brew coffee is delicious! P.P.S. Newspaper mulching is working ! Going to get started as soon as I get some growing medium! Hi, Kevin! What a wonderful thing to share! Thank you so much. I just love petunias and the smell too. Excellent photo tutorial, as usual. I don’t have any petunias right now, but if I did this project would be wonderful as a make-ahead-winter-cheer-up. I do the same for my Coleus, having kept the same ones for 3,4 and 5 consecutive summers now. Buy once and grow indefinitely through cuttings. It’s all good! Embarrassed to say I have a splendidly little petunia that has been indoors all summer, dead leaves and all. Hoping this technique will work to create a more full an lush plant. Also, Kevin, do you know anything about saving my fuchsia for winter? I just got an LED grow box and I am now harvesting herbs. How quickly they grew..and I didn’t kill them like I do when they are in pots. 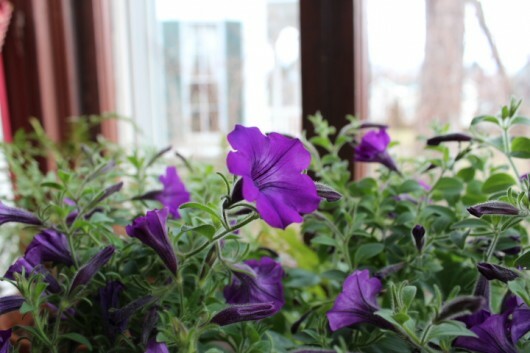 How wonderful to try petunias this winter in my bright sunny window. Thanks for the terrific idea. Keep them coming! I have a favourite petunia “Much Picasso” which I hunt around for every year. How could I propagate in order to have these flowering next summer? Great instructions ..I love this idea! You are absolutely amazing with All of your creative efforts. I only have a very small slot of time to enjoy websites so I ditched all of my other newsletters and only enjoy yours. You captured my attention with your wonderful post about violets. Matter of fact I even got brave enough to order some Leaves from Ebay.So, thank you so very much Kevin for all of your time and effort and keep up the great work. You are a gem . I really have to thank you so much for this idea Kevin. I did this last year at your suggestion and I ended up having a window full of glorious colourful petunia blooms in January. What a delightful contrast to see all that colour and then see the snow banks on the other side of the glass. Then this spring I cut those plants way back and planted them up in a new summer home and they have continued to bloom and delight all summer. I was thinking this would be an excellent way to collect some great varieties of petunias and like plants. I did start another colour of wave this year from seed. Also how horrible would it be if I took a couple of small cuttings from the plantings that the town has on the boulevards? They have some gorgeous colours of petunias sure is tempting to take a few little snips. I became a big fan of outdoor window boxes a few years ago, and tried several different flowers with generally disappointing results. Tried petunias this year, and became a huge fan – that’s all I’m doing in the future and will be making more window boxes. I’ve been wondering how I can keep them going from year to year – you solved my problem. Thanks! So excited to try this, I just hate when fall comes & I loose all my pretty blooms. Thank you for the tips! BTW your window garden is beautiful!!! Oh my God! I’m already crazy about my garden, and now I can bring it all INDOORS????? My husband is going to kill you. I think he was hoping for a break over the winter from my endless chatter about my plants. So, it’s later than August, but I’m in Philly. My geraniums, impatiens, and petunias are still going strong. I’m going to try to cut them all back, but I’m a potter, so I’m also going to try and make some pots for all of them, so it’ll be a couple weeks until I have them finished. Can I put clippings in water if it’s going to frost? I think we’re good here for a couple of weeks anyway, but I thought I’d ask. Also, the only nice light I have is in my studio. It’s pretty cold in there, though. Probably 50’s at night and then high 60’s during the day. Will they still bloom? I am SO EXCITED ABOUT THIS!!!!! Maybe I can have a bunch of them blooming in pots for my holiday sale in mid-December. Thanks. I did as you told and took 15 cuttings. Pink, purple and mauve with purple striped. 3 of them didn’t make it. The pink ones are doing best. They are kept moist/on the dry side. Not wet. Now another 3 show powdery mildew. (The purple ones). I didn’t plant more than 3 in a pot. They are sitting in a window facing west. Location: Southeast New Brunswick, Canada. What did I do wrong? How can I treat them/avoid it? Kevin, your info is fabulous! I am a very busy realtor and have a big house and yard to manage (with help of course) but you inspire me to enjoy it all. Your blog is the only one I follow religiously. I am going to look for that fertilizer and also going into my potting shed and finding a clay pot to use as a sacrifice for the benefit of others. Thank you! Liz’s comment at #83 has warned you her husband is coming after you. If you have to go into witness protection, we all hope you’ll still be able to publish a blog. Kevin, you are a wonder and a whiz. Thank you. I love your posts and I love petunias. I’m trying this. I love petunias and appreciate your suggestions. Your garden is absolutely beautiful and I look forward to your blog. This comment has to do with your lovage pesto recipe. Because I have a lot of Lovage in my green I made the lovage pesto and served it to a local garden club when they came for a garden tour, tea and talk. EVERYONE LOVED IT. It was so delicious. I served it as a spread on crackers. When my leaves grow again I certainly will put the next batch on pasta. Some didn’t know what lovage was and wanted to rush out and get a plant or two. Knowing it took a lot of leaves I suggested they buy a couple of plants. Mine was too well established to dig up this time of year. I am so glad I read this, I already re-pot my geraniums, and now I’ll take petunia cuttings, too! Thank you ! I am so going to do this! How do you feel about Epsom salt as a booster(1t. Per gallon of water)? Thank you, gonna try this this fall, you’re the greatest. I discovered a pink and white petunia growing in my front garden this week. I haven’t had petunias in 2 years, so i am quite excited that a little seed has grown and bloomed. I am going to bring it in for the winter and try to give it a bit of extra love after the harsh start it has had! I wasn’t sure petunias would do well inside, but I am happy to have found your website! Thanks Kevin! I spend a fortune buying petunias every season. This is a fabulous idea. I can’t wait to try it! We gardeners learn a lot from each other, and thanks to you I now know how to start petunias from cuttings. I live in a temperate zone on the Central Coast of New South Wales, Australia, near the sea. I have a tiny Japanese Garden, and also grow – bromeliads in containers (neoregelia variety) for year round colour. I have two questions about petunias. I have read that you can direct sow petunias outside in Feb/Mar in zone 5? True. We have strange weather here this year, central Illinois-40’s 50’s during the day and high 20’s 30’s at night. Also, where do you get your glass shelves. I have tried to find to no avail. Thanks! Hi Terry – I’ve winter-sown petunias successfully here in New York’s Hudson Valley (zone 5-b). Click here for details. I had a glass cutting shop make the shelves for my windows (click here for more details). To find such a shop in your own neck of the woods, just Google “glass cutters” or “glass cutting” plus the name of your town. Kevin, do you sleep? I can’t believe you are so successful with all your cuttings.Can’t wait to try the process myself. Thank you so much for the detailed direction on how to propagate petunias! I think I can actually pull it off now! I love petunias and now I can have them around all year long! Wish me luck! How neat! I have to try this one. Petunias in containers are more prone to leggy development. If you want to keep these petunias looking beautiful, you should deadhead them more often. 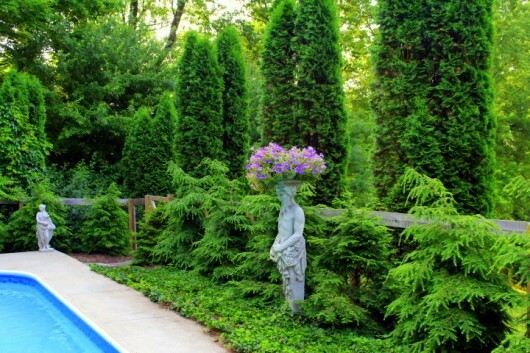 Watch them closely and prune when growing too tall. Thank you, Kevin, as always! Yet another wonderful idea, beautifully illustrated and explained with your usual clarity and humor. I will be clipping my pink petunias tomorrow. For those of us who don’t currently have petunias, they are ridiculously cheap at most garden centers….so this is worth a try! I love you Kevin!!!! My fave flower is the purple petunia because of the color and wonderful smell. Now I can have them all year round. You are a true genious. Many Thanks from Canada, land of the frost and free! Great idea… and easy peasey! Thanks for sharing. Love this idea! When the summer days are beginning to shorten and winter threatening around the corner, this almost makes winter bearable. Not only are u a great cook but an awesome plant manipulator. Your beagle must be in awe:-). Thanks so much for sharing. Kevin, I noticed that you use broken terracota to cover the bottom hole of a pot. I used to as well, I now use nylon screening and nothing but water leaves my pots. Great tip! I’m going to try this. Your lovely window reminds me of my Mother’s when I was a youngster growing up. She had the same brackets and glass shelves loaded with mostly African violets and a variety of other plants which I don’t remember. Thanks for the encouragement. I have tried bringing in petunias, impatiens – messy, geraniums but never started them from cuttings. I will do the petunias – yes I love the purple – some coleus, and possibly some lantana which I will ‘bonsai’ into a small shrub. Never short on projects. I just started several planters of Wandering Jew which is a favorite and tolerates low light through the winter. Also started the Hawaiian spider plant which I’ve never had before. Thanks again for all your tips and tricks. Tried bringing in a petunia plant last year….didn’t work so well. Definitely trying this method!! Usually bring in geraniums each winter, just like my Mom always did. Love seeing the cheerful flowers in the dead of winter. Never had any luck with over-wintering a lantana….any ideas or suggestions? send me email with good idias i like the way you explain . 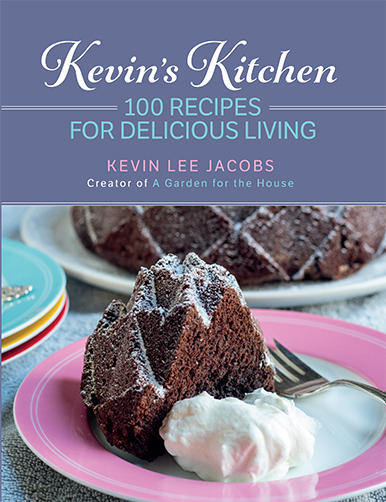 Hi Kevin, you always have such great ideas (and recipes!). When you say florescent lights…are they regular or grow lights? I’ve been looking at some LED’s fixtures that look like regular florescent lights and am wondering how they would work. (we are on solar electricity and need to be mindful of our electric usage in the winter months) What say you? Hi Nancy – I’ve read that LED lights provide superior illumination for plant growth/bloom. Alas, I have old-fashioned “cool white” fluorescents. Thanks! That’s so informative! Really appreciate it.